Andrew Castrucci, “C.B. 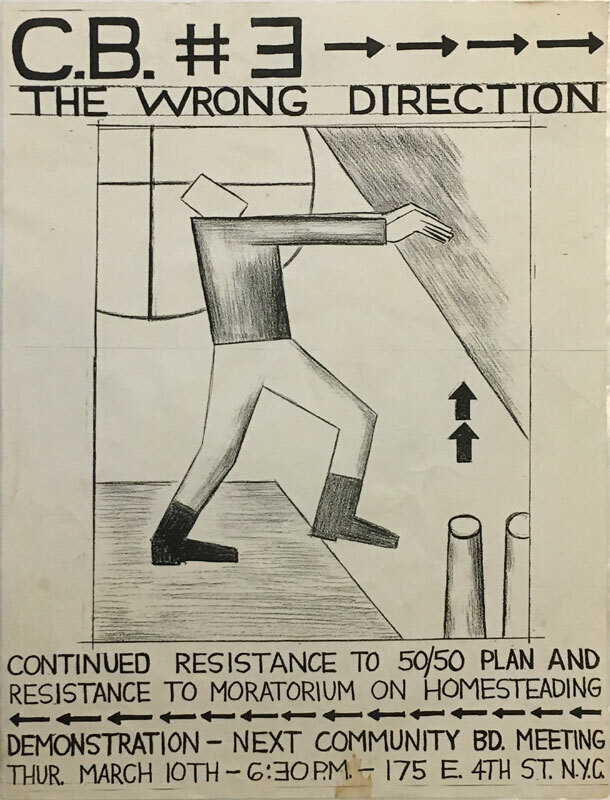 #3 -> The Wrong Direction,” 1988, Xerox, 11″ x 14 1/2″, signed by artist in pencil and embossed with Bullet Space seal. In the late 1980s, as New York City’s economy picked up, Mayor Ed Koch plotted with powerful developers to privatize real estate holdings that the city had previously taken over from delinquent owners, including some buildings occupied by squatters. Castrucci’s poster promoted a demonstration to be held at an upcoming meeting of Community Board 3 (which serves the East Village).